It’s that time of year again, Although it’s a bit chilly outside soon it will be summer training time! For those that are new to cadets, Summer training (usually referred to as ‘camp’) is an extension of our weekly training into the summer. 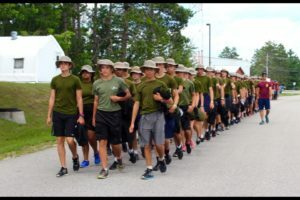 For us at 21, our summer training primarily takes place at one of two ‘Cadet Training Centres’ (CTCs) – Blackdown CTC, located on the footprint of CFB Borden, near Barrie and Connaught CTC, located just outside of Ottawa. There are other advanced training available for senior cadets in the Rocky Mountains and exchanges in the UK and Europe. Summer training is open to all cadets and is at no charge to the cadet’s family. Staffing, transportation, accommodation, training & activities and food is provided by DND. Cadets even receive a small training bonus of $10/ day! All the cadet has to provide is their personal kit (i.e. running shoes, toiletries, undergarments, sleep wear etc. ), and prescription medications as needed. The CTCs also offer medical services (provided by military med-techs and civilian nurses), security (by the military police), personal wellness (by military padres) and several activities during ‘down time’ (i.e. a cadet canteen, arcade, bike and sports equipment loans, special visits etc.). Cadets are provided bunks in semi-permanent, gender specific tents with 5-7 other cadets and have access to showers and washrooms. Meals are 3 times a day in a military mess (and the food is pretty good!). Supervision and instruction is provided by a combination of adult staff (CIC officers and Civilian Instructors) and senior cadets that work at the CTC as staff cadets. Green Star cadets can apply for “General Training’ or GT. GT, for us, takes place between 5 Aug and 16 Aug at Blackdown, with transportation on 4 Aug.
GT is an introduction to life at a CTC and the various disciplines that a cadet can specialize in advanced years, Namely – Marksmanship, Music, Expedition, Drill and Ceremonial and Fitness and Sports. Cadets are kept busy starting at 0600 and training continues until 20:00 (with some downtime in-between) and it goes for 6 days a week. Sunday is a free day and families are encouraged to come visits their cadets and take them for off base for visits. Second year course is what is referred to as a 3 week “basic” level courses. This year our basic courses run from 29 July – 16 Aug. 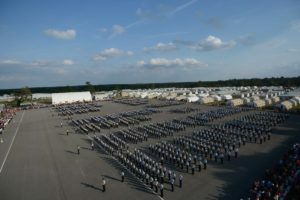 This level gives the cadet the opportunity to focus their summer training on one discipline and determine if that’s the path they wish to pursue. 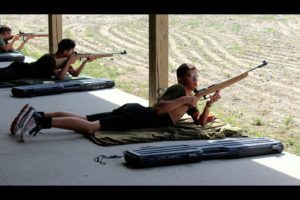 Basic Marksman takes place at Connaught CTC while basic expedition, basic band, basic fitness and sports and basic drill and ceremonial all happen at Blackdown. This is the 6 week ‘instructor’ level courses, running from 9 July to 16 Aug. These courses are the advanced level courses with the intention of giving senior cadets the skill-set to take their knowledge back to the corps and assist in the teaching of each discipline. Again, the marksmanship thinning takes place at Connaught CTC and all the courses take place at Blackdown. Senior cadets can apply for ‘Maple Leaf Exchange (MLE) in the UK or “Army Cadet Voyage through History” in Europe. These are excellent opportunities for cadets to get to see a bit of the world (for free) and be part of a truly unique adventure. Any seniors that are interested in exchanges should talk to me or the other staff for the details. The competition for these experiences is fierce and requires additional steps to apply. Am I guaranteed to get a camp offer if I apply? No. Each corps is allotted a certain number of positions for each course and no one is guaranteed to get in. We will attempt to make sure that we get as many cadets to camp as we can. I know I have driven my daughter to Blackdown the day that the course started, so it’s never too late. Camp offers sometimes come out sporadically, but we will let the cadet know as soon as we know – generally around March/April. Can I visit my cadet? Can I call? Visits are encouraged but it’s recommended on a Sunday as that’s a ‘day off’ for cadets. Cadets on 3 and 6 week courses can also be signed out for day or overnight leave by their parents or other, pre arranged adults. There are payphones at all CTCs, cadets will need a calling card to use the payphones. Cadets may also bring their cell phones, however they are locked up and are only available for sign-out during specific times and these times can change depending on the goings on at the CTC. If I don’t go on GT, will I be able to apply for other courses in coming years? Absolutely, GT is a good intro to CTC life and I’d recommend it for all cadets, but you can apply for courses in future years if you wish even without going on GT. What do cadets need to bring to the CTC? The joining instructions (JIs) will be released before the start of summer training. This document covers most of the requirements and information about the CTC. 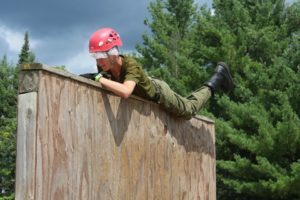 What if my cadet needs medication or gets sick or injured at the CTC? All medications are locked up in the company office and are administered under the supervision of adult staff. Cadets that require inhalers, Epi-Pens or similar medication will keep them on their person at all times. Unfortunately, cadets do have some medical issues as camp, but all CTCs are staffed by nurses and CF med-techs to provide first aid and some more advanced medical assistance. For cases that require a hospital, cadets will be transported by DND vehicle or ambulance, as required. I know this is a short intro to summer training and for those that are interested, we are looking into having a short Q&A session in the upcoming weeks. Applications need to be submitted no later then 18 February in order to get processed for the deadline at the end of February. 21 Royal Highland Fusiliers of Canada Army Cadet Corps.